This post might be on more material than the first book contains. Fullmetal Alchemist by Hiromu Arakawa is a manga with highly addictive qualities. 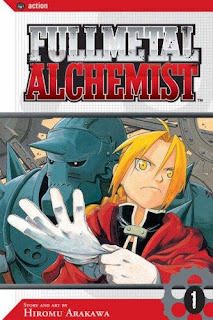 It is about two brothers, Edward (Ed) and Alphonse (Al) Elric who live in a different world where alchemy exists, and the technology isn't as advanced as ours. It starts with Ed and Al walking through a desert and finally finding a thriving desert city (in the middle of nowhere), called Liore. The people told them that the city was a dump until Father Cornello came and got them on "The Sun God, Lito's" good site, thus him being able to preform "miracles". Ed and Al's back story is that they grew up in a little town in the suburbs. Their dad left when the were young, and they spent most of their time at their dad's friends house with a childhood friend, Winry. When their mom died they tried to bring her back to life, costing Ed an arm and a leg (literally). It took Al's body resulting in him turning into an empty suit of armor. My favorite character is probably Al. I like him because he's a cute little kid, when he has his body. When he's a suit of armor, he keeps his brother from doing anything too stupid. I also like Winry, who supplies Ed with regular "auto-mail (artificial limb)" check ups and comes on a few of their adventures to assist them. Her parents were both doctors in "The Ishvalan War" and they got killed, causing great grief for Winry. My favorite part of the physical books is the extras. They're normally about some part of the book that could be made fun of or misunderstood, causing the ability to be made fun of. My favorite one is when they make fun of Ed for being short, so what happens is Ed finds a genie and he wishes to be taller. When it refuses to do that Ed gets very mad and tries to combine all his wishes to make him at least "a few centimeters taller". Just a thing to note, if you want to watch the anime, there are two series. The first one is the english one, which only goes up to a certain point (no, I'm not telling you when) then takes a very sharp turn, and ends. The second one, which is titled Fullmetal Alchemist: Brotherhood, seems (I haven't seen it) to stick to the manga more than the other one does. Seeing as the manga is still going on, I don't know if the second series is still going or if it stopped. So, what I find interesting is that I think this is the first book that I know of that has two T.V. series, two movies about what happens after the first T.V. series, a game, an app, and a series of written books based on it. I hope you like this book as much as I did! This series is still coming out and I think they are up to book #27. Keep an eye out for the others!